Entry includes additional Children’s Christmas Disco, stories from the big man – SANTAAAAA! PLUS elves workshop where you can decorate your own toy! 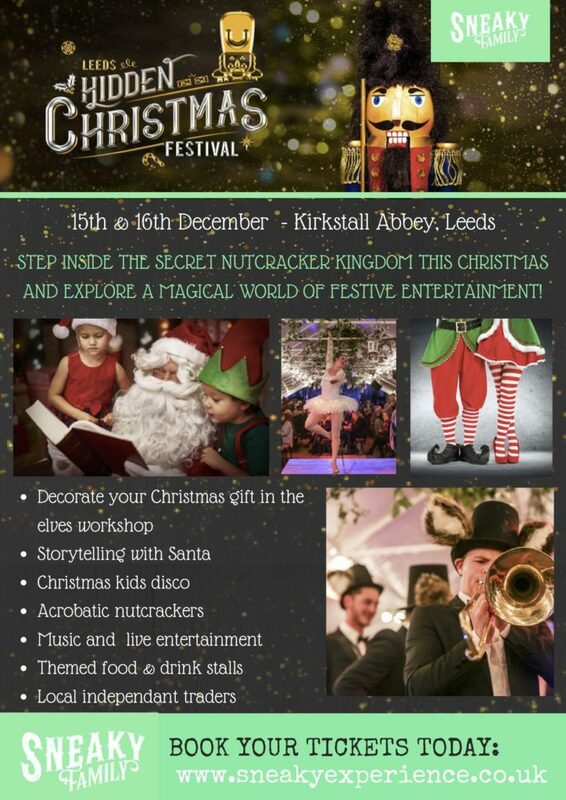 We’ve teamed up with Sneaky Experience to offer Mumblers a chance to WIN a Family Ticket to ‘Leeds Hidden Christmas Market’ (2 adults & 2 children) valid on the 15th and 16th December 2018 for the 10am-12.30pm, 1.30pm -4pm or 5pm-7.30pm time slot. To enter you just need to CONTACT US with the words ‘SNEAKY EXPERIENCE’ before Midnight on 8th December 2018. The winner will be chosen at random and contacted on 9th December. 1. This competition is open to any person resident in the UK who is over 18 years old. Employees of Sneaky Experience or its affiliates, subsidiaries, advertising or promotion agencies are not eligible. Employees of Leeds and Wharfedale Mumbler are not eligible. By entering, the participant agrees to be bound by these Terms and Conditions. 5. The prize is not transferable and no cash alternative is available. The prize must be used on 15th or 16th December 2018.